EXTREMELY FINE GEM. 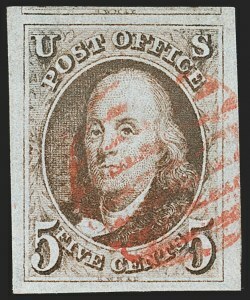 A SUPERB USED EXAMPLE OF THE 5-CENT 1847 ISSUE, GRADED SUPERB 98 JUMBO BY P.S.E. EXTREMELY FINE GEM. 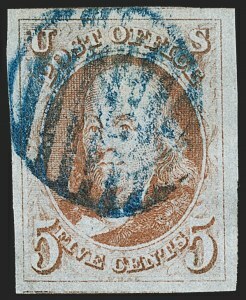 A MAGNIFICENT RICHLY COLORED USED EXAMPLE OF THE 5-CENT 1847 ISSUE, GRADED SUPERB 98 JUMBO BY P.S.E. EXTREMELY FINE GEM. 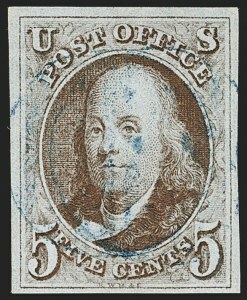 A SPECTACULAR USED EXAMPLE OF THE 5-CENT 1847 ISSUE, GRADED SUPERB 98 BY P.S.E. With 2006 P.S.E. certificate (Superb 98; SMQ $4,000.00). This is one of only four awarded this grade with just five higher. EXTREMELY FINE GEM. 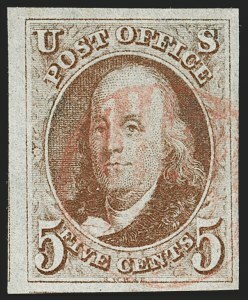 A GORGEOUS USED EXAMPLE OF THE 5-CENT 1847 ISSUE IN THE DARK BROWN SHADE, GRADED SUPERB 98 BY P.S.E. -- THIS IS THE HIGHEST GRADE AWARDED. EXTREMELY FINE GEM. 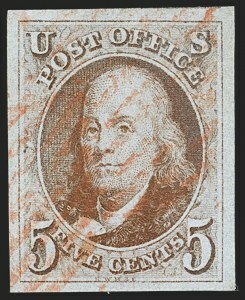 A SUPERB USED EXAMPLE OF THE 5-CENT 1847 ISSUE IN THE ORANGE BROWN SHADE, GRADED XF-SUPERB 95 BY P.S.E.. EXTREMELY FINE GEM. 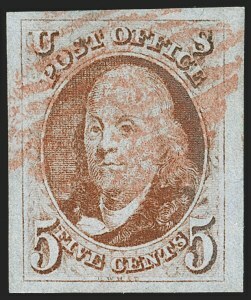 A SUPERB USED EXAMPLE OF THE 5-CENT 1847 ISSUE IN THE DISTINCTIVE AND DESIRABLE RED ORANGE SHADE. 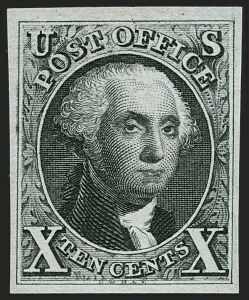 THIS SPECTACULAR STAMP IS GRADED XF-SUPERB 95 BY P.S.E. -- THIS IS THE HIGHEST GRADE AWARDED AND IT IS SHARED BY ONLY ONE OTHER. 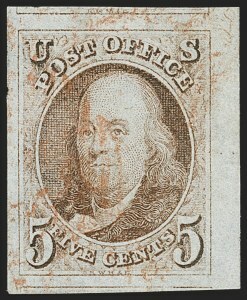 According to a series of articles by the late Calvet M. Hahn in the Collectors Club Philatelist, the Red Orange shade was printed some time during the fourth and last printing, which took place in December 1850. 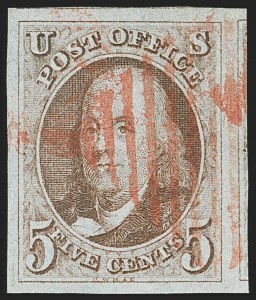 Research by Wade Saadi indicates the Red Orange shade was produced exclusively during the last printing, stamps from which were part of the Fifth Delivery (December 7, 1850). 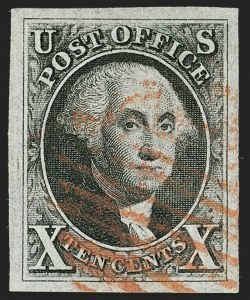 The stamp offered here was part of an important West Coast collection built before World War II. It was acquired privately by "Argentum" (Dr. J. A. Graves) through Raymond Weill and later sold by the Siegel firm as part of the "Argentum" collection (Sale 807) to John C. Chapin. 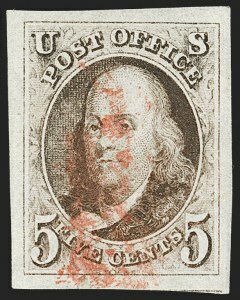 Because this stamp was hidden in an album for nearly 50 years, its color is much stronger than that of most Red Orange examples seen today. EXTREMELY FINE GEM. 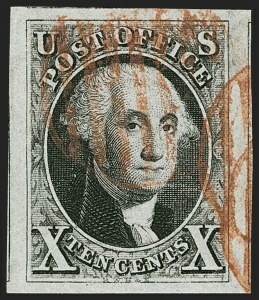 AN ABSOLUTELY SUPERB USED EXAMPLE OF THE 5-CENT 1847 ISSUE IN THE ELUSIVE BROWN ORANGE SHADE, GRADED XF-SUPERB 95 BY P.S.E. -- THIS IS THE HIGHEST GRADE AWARDED AND IT IS SHARED BY ONLY TWO OTHERS. This XF-Superb 95 grade is the highest awarded by P.S.E., and only three have achieved it. 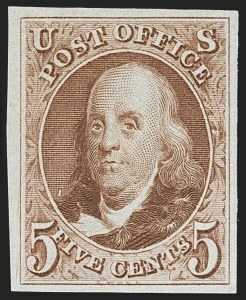 As an indication of the 5c 1847 Brown Orange shade's rarity in superb quality, it is revealing to note that the much higher cataloguing 5c 1847 Red Orange shade (1c) is listed in the P.S.E. Population Report with two in the grade of 95, just one less than the number of Brown Orange in 95. With 2013 P.F. and P.S.E. certificates (XF-Superb 95; SMQ $4,500.00). EXTREMELY FINE GEM. A SPECTACULAR USED EXAMPLE OF THE 10-CENT 1847 ISSUE IN THE FINEST CONDITION ATTAINABLE AND GRADED SUPERB 98 JUMBO BY P.S.E. -- THE HIGHEST AWARDED. With 1994 (as a pair), 2001 P.F. and 2016 P.S.E. certificates (Superb 98 Jumbo; SMQ $13,500.00). This is the highest grade awarded and it is shared by only four others. This is the only copy to come up in our sales since 2012. EXTREMELY FINE GEM. A SUPERB LARGE-MARGINED EXAMPLE OF THE 10-CENT 1847 ISSUE WITH AN ORANGE RED CANCEL, GRADED XF-SUPERB 95 BY P.S.E.